Stanley has been making tools, beverage containers, and other food storage products since 1913. Traditionally targeted to the lunch-pail-carrying crowd, they’ve introduced a new line to seemingly appeal to the younger, hip set with recycled and recyclable materials, and bike bottle-cage friendliness. I’ve used a “coffee ring” type of cage on my commuter bike for a couple of years now. Many of these are cheaply made, with a plastic handlebar clamp that slips when under the load of a full coffee mug. I found the Origin8 Joe-2-Go coffee cup holder works well, but you’ve still got to select your travel mug carefully–not too wide, not too narrow, to fit in the holder securely, and either no handle or a handle that is open on the bottom end. Even then, a good bump in the road can send the mug flying out of the holder. The advantage of a bike bottle-cage friendly coffee mug such as the Stanley Nineteen13 eCycle Mug is that it’s held securely in the cage just like a standard water bottle. It doesn’t require a special type of cage, so it can be easily moved from one bike to another. Like any thermal-type mug, it keeps the hot stuff hot and the cold stuff cold better than a typical plastic bottle. I received one of these mugs as a Christmas gift, and took advantage of the free hour I had between errands today to test it out. I filled it up with some fresh hot java and rode with it on the Salsa Fargo up to Solon to visit for a bit with Brent while he was at work. 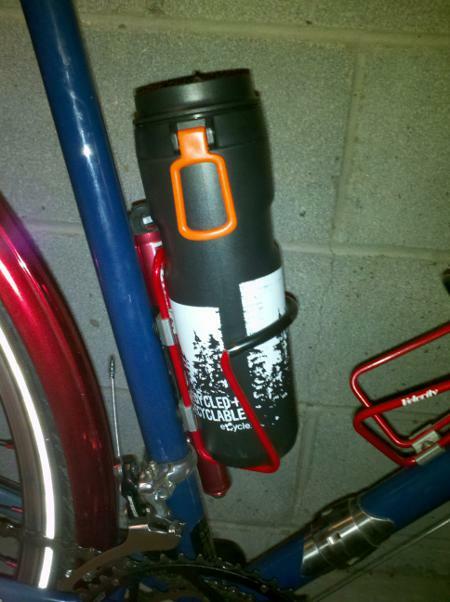 As advertised, the eCycle mug stayed put in my bottle cage, even after a couple of curb-hops. The lid stayed securely closed with no leakage. I enjoyed the still-hot beverage when I arrived in Solon. The eCycle mug holds 16 ounces. The moving parts of the leak-proof spout can be disassembled for a full cleaning (which, if you’re a typical dude like me, will probably happen about twice a year). Everything is microwave and dishwasher safe. It’s also got a loop that would let you clip it to a belt loop or backpack strap or the like. My only complaint is that the mug is too tall to fit and stand on its own in a Keurig single-serving coffee brewer, but that’s the case with almost all of my travel mugs. In short, if you’re looking for an easy and secure way to enjoy coffee during your commute or other bike ride, the Stanley Nineteen13 eCycle Mug fits the bill, for about $15. Where can you buy it? I have not seen any bike shop or other store that has them in stock, but just about any local bike shop can order them for you, because they can be obtained through Quality Bicycle Products, one of the largest bike accessories distributors that most shops deal with.